Brethren I would like to warmly welcome you to our website which is very informative and kept up to date by our webmaster Bro Drew Calderwood WSW/IPM. 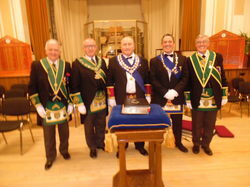 I would like to thank all who attended my installation and for the brethren of 153 for allowing me to be RWM yet again. They say that one day I will get it right though I have my doubts. As you can see when looking at the syllabus we have a very active season ahead, with a couple of special nights being The Mark Wright degree team carrying out the Mark Ceremonial at the end of March, and also our Reigning Masters degree at the end of May. A warm welcome is always on the agenda when you visit us and we greatly appreciate our visitors coming along to support us. Look forward to seeing you soon.Contact Page. With over 600 Lodges in Scotland and thousands worldwide, Freemasonry can open up a vast network for friendship. Bro. Robert T. Craig, P.M.